Detox and reset with 2X the antioxidants (vs. Pantene Repair & Protect shampoo). Experience Pantene's exclusive DreamCare Pro-V formula. What makes DreamCare extraordinary? Rich lather wraps every strand. Nourishes for effortless detangling (use as a system with Damage Detox Daily Rebuilding Conditioner). Works all day for lasting shine. 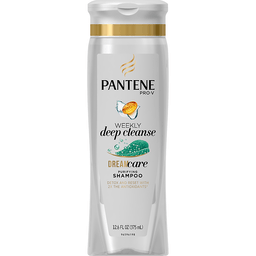 The Weekly Deep Cleanse Purifying Shampoo with 2X the antioxidants (vs. Pantene Repair & Protect shampoo) deeply cleans to remove impurities and reset hair. Satisfaction Guarantee: If not satisfied return a proof of purchase for a refund via prepaid card. Call 1-800-522-2106. Questions? 1-800-945-7768 or visit www.pantene.com. Made in USA of US and/or imported ingredients.